We put in over fifteen hours of research and testing to come up with our selection. We narrowed down the options by looking at pre-made first aid kits best specifically designed for parents of young children. We spoke with a school nurse and a pediatrician to get advice on what is commonly recommended for inclusion in a first aid kit. And we used real-life testing by watching the reactions of kids to the cute characters; we even stuck a bunch of bandages on boo-boos to see just how well they adhered to nature’s most sticky surface: busy toddlers. 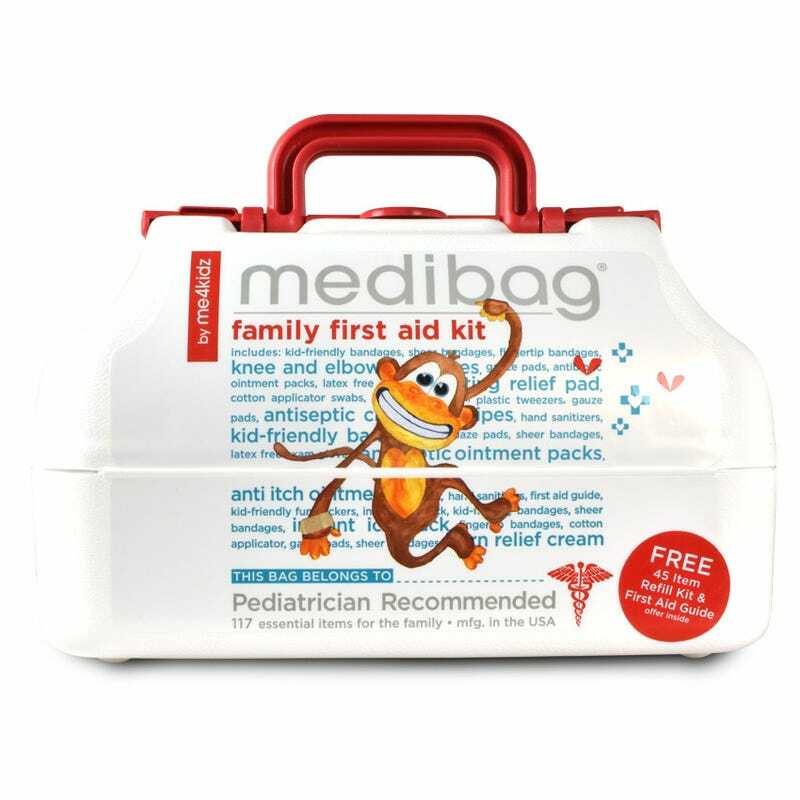 After all that, the Me4Kidz Medibag Family First Aid Kit won out as the best choice for most parents. Families with allergies, special medical needs or specific preferences on materials to use in first aid situations (like using natural herbs or essential oils instead of an antibiotic cream) may prefer going the DIY route. This will allow you to include items like epinephrine pens, prescription medicines, liquid pain or fever reducers (for children that can’t yet swallow pills), clay diffusers, or all-organic products. Our selected kit has plenty of stash room for your chosen extras. For the everyday consumer, being able to quickly grab a pre-made first aid kit and trusting it has everything they would need is a big convenience. It’s commonly recommended that a family have a large selection of first aid items easily available to parents (but safeguarded against children) in a central location of their home and any home the children spend more than a few hours at regularly. A smaller portable first aid kit should also be stored in any vehicle that frequently transports the family. Finally, a smaller, travel version of a first aid kit should also be included in a diaper bag or purse when the family is out and about. Our selection is inexpensive and compact enough to be stashed anywhere in the house, although it’s too large for a diaper bag; we’d suggest DIY for your run-and-gun kit. First aid is old—ancient even. The earliest recorded evidence of dressing wounds is from 500 BCE, as depicted on classical Greek pottery. While essential materiel in warfare, the concept of the first aid kit developed further as families made long treks toward new homes and distant lands. For millenia people were faced with hardships like snakebites, diseases, rough terrain, and heat exhaustion while on the road. Traveling clerics and doctors packed potions and tinctures in vials, as they saw fit; the basic process in treating minor wounds has remained largely intact, even if we no longer use lint, animal grease, and honey. The first patent issued for a modern pre-made first aid kit was applied for in 1942 by Clementine F. Campiglia. (And there were certainly pre-made kits before that.) It looks very similar to first aid kits available today, albeit with a little more leather. Since it’s unlikely you’ll need supplies for battle or long trips across the Oregon Trail—but you do you!—what should you include in a DIY first aid kit or look for in a pre-made version? We first reached out to Lauren Meyer, a mom and school nurse in St. Louis. She provided us with an awesome list of the items she uses most often and keeps on hand for minor emergencies. a small thin scarf to be used as a temporary sling or tourniquet while waiting on emergency crews. Many pre-made kits include an antibiotic ointment. That’s fine. It has its uses. We still recommend adding it to your own kit. Just remember there’s no need to use antibiotic ointment prophylactically for every little cut and scrape. Common topical triple-form antibiotic ointments like Neosporin may even contribute to the evolution of drug-resistant strains of more dangerous bacteria, like MRSA, over time. You can expect to pay anywhere from $5 to $100 for a first aid kit or the supplies needed to make your own. Many first aid kits are priced higher, typically when chocked full of a large number of contents. Check the label carefully to ensure that the item is giving you a variety of needed supplies and not just an abundance of bandages. In most cases, you won’t need 20+ bandages in one accident. (And if you do, you have bigger problems on your hands!) First aid kits can always be refilled. We prefer to save money up front for a kit that has more obscure items like different sizes of bandages, treatment for bee stings or allergies, cleaning supplies, and a good case. Since the business of boo-boos is quite an unpredictable one, testing for the best first aid kit was a little different than how we normally test. We first narrowed down the market of first aid kits to ones in a reasonable price range. (Under $30.) We then compared the included items on the remaining first aid kits’ lists against the recommendations of our experts. For those that made the cut, we did hands-on testing. We used the bandages and alcohol wipes in a few real-life scrapes and cuts with our own kids, and we covered ourselves with bandages in the toughest places to see just how well they lasted. (You know, things like elbows and fingertips and knees.) We ripped the bandages off like we would a child as well—quickly. (They all hurt a little bit; no front runners there!) Any item in the first aid kit that we could physically open to test, we opened. There were a few things we couldn’t test (such as bee sting ointment) because we weren’t faced with that emergency—and Joel doesn’t pay us to hunt down bees—but we did open the packets to ensure frustration-free opening. In addition to this, we researched what other users were saying about the first aid kits and tried to replicate any complaints we’d heard. After many hours of research over several weeks of comparison and testing, I am confident that the Me4Kidz Medibag Family First Aid Kit is the one to buy; it best matches the needs of an everyday user with quality items and is available at a very reasonable price. In addition, the Medibag has a child-proof (and yes, sometimes a little adult-proof) hard case with a lot of extra room, making it the only one we tested that gives you the ability to add those extra specialty items your family may need while still keeping everything securely in a single place. There is room for your daughter’s Epi-Pen or your son’s teething gel. There is enough room to add the few things the kit doesn’t include that experts (including the CDC) recommend as well, like surgical gloves or possibly a mylar blanket, which some competitors include in their kits but this one does not. (You can pick up a 20-pack of mylar blankets for 12 bucks and stash them in your cars, if you want. While many of the items included in this 117-piece kit are bandages, the Medibag makes sure you will have a lot of different types of them, including ones specifically designed for fingertips, small spots, knees and elbows. These are kid-friendly bandages with fun prints to help your little one smile after falling down and matching stickers to distract or reward them for being brave. In addition to bandages, the Medibag includes an instant cooling pack, burn relief cream, sting relief cream, antibiotic ointment, cotton swabs, hand sanitizer, sting-free alcohol wipes, and gauze pads. It comes with an emergency family information label and, as an added bonus, an available free 45-piece refill kit to build up your supplies again when needed. The price on the Me4Kidz Medibag Family First Aid Kit is great, too. At under $15, it’s hard to find such variety for less money. An extra plus: Me4kidz is family-owned and operated in the United States. The kit is made from recycled, lead-free plastic. Furthermore, Me4Kidz has teamed up with a non-profit organization to provide employment to disabled citizens. Not only does Me4kidz offer a great product, they seem to have a highly respectable corporate philosophy. The biggest complaint we’ve found about the Medibag is how hard it is to open and close. Since it is a child-proof case, this is true, but its latching mechanism isn’t too difficult for adults—I certainly feel that a secure latch is better than one of my little ones getting ahold of something that would be harmful if ingested. From my testing, I do not believe this factor would make the first aid kit too difficult to open during an emergency. Users on Amazon have been a little brusque in their reviews. Overall, the Medibag has a rating of 3.6 out of 5 stars with nearly 60 reviews. User, “Jenny Johns” writes, “I am a pediatric ICU nurse and I couldn’t think of a better product to protect children. The medibag has all one would need, whether it be to fix a cut or respond to emergency situations.” One critic of the first aid kit writes, “All of the packaging for the supplies looks the same. So in a hurry, you might grab antibacterial ointment instead of burn cream. The packets are small and hard to open. The supplies are relevant and my kid doesn’t freak out when he sees it though.” This user still gave the Medibag 3 stars. Unfortunately, many of the small amount of users who rated the first aid kit at just 1 star did not give descriptive reasons for their low ratings. The Me4kidz Medibag Family First Aid Kit has been featured in dozens of magazines including the Health and Beauty Care Executive, Buyer’s Guide: Pregnancy and Newborn, and Brand Packaging. Me4kidz has won awards for its product line as well such as the iParenting Media award, the Preemie Cool Stuff award and the Family Choice Award. They’ve also received the National Parenting Center seal of approval. As we mentioned above, making a homemade first aid kit is also a very good option. We ultimately decided on the Me4Kidz Medibag Family First Aid Kit because of the convenience and price but there are plenty of benefits to creating a do-it-yourself kit as well. You can pick your favorite brands of ointments, bandages and medicines or omit those types of things completely if first aid takes on a different meaning for your family. The cost of a homemade first aid kit varies on your preferences. You’ll want to be sure to store everything securely in one place. Start out with a heavy duty gallon sized ziploc bag or go to your local dollar store and get a shoebox size plastic container with lid. If finances are a concern, you can stock up on a few items at a time, spending just a couple dollars with each trip to the store so it isn’t noticeable. If you’d like to take your first aid kit to the next level for your family, ready.gov offers an extensive family emergency plan to be prepared for any situation, disaster or emergency. They recommend keeping this large kit in the lowest level, in the most interior space of your home. It is also recommended to have a version of this kit in any vehicle you travel in with your family. The extensive emergency preparedness kit includes having extra outfits for every member of the family, flashlights, batteries, and food and water for up to 72 hours. Think of this type of kit being what you need for basic survival in the event that a major catastrophic event happens in your neighborhood. In addition to the items Mrs. Meyer and Dr. Barghava recommended, the CDC offers an expanded list of what you should include in your first aid kit with items like a saline eye wash, thermometer, anti-diarrhea medicines, laxatives, scissors and/or aspirin. Specifically for planning with children under the age of two years old, you may want to consider adding things to your first aid kit like powdered milk or formula, diapers and wipes, an extra bottle, diaper rash ointment, and extra blankets. Wallaboo Basic First Aid Kit for Babies—This kit is really great quality and includes everything our experts recommend. Only downfall is it is over twice the cost of our pick and includes only a third of the total number of supplies. Johnson & Johnson All Purpose First Aid Kit—This kit is comparable in price and quality to our pick but the case is not as durable and not child-proof. AAA 121-piece Road Trip First Aid Kit—More expensive and is not kid-friendly. The First Years American Red Cross On the Go First Aid Kit—This kit has only half the amount of items as our pick for the same price. The case is not big enough to add extras too nor is it child-proof. Convenient First Aid Kit—Less items for nearly twice the price. The Complete First Aid Kit—Again, less items for well over twice the price. Lifeline Red Premium Hard Shell First Aid Kit —The price of this kit ($45) does not seem reasonable for the average consumer. There are also several complaints that the kit has an expiration date very near to when receiving with no explanation of what items expire or need to be replaced making the first aid very expensive to maintain. Adventure Medical Kits Day Tripper—While a good kit, this is designed more for a more outdoorsy type use doing things like camping or hiking, not specifically for everyday family use. A variety of other options were excluded similar to this one by AAA which is designed to be an emergency road assistance kit and includes extras like jumper cables and a flashlight as well as this type of kit by ResCue 1st that is marketed for emergency preparedness in relation to natural disasters and features items like whistles, particle masks and a poncho. Do bear in mind that most of the creams and ointments in a first aid kid will eventually expire; each packet has an individual expiration date printed on it. (You might set a calendar reminder for 2 years to go through and check, which is the expiration date for the kit after the date of manufacture.) Hot temperatures can accelerate the loss of efficacy, too, so a kit that’s left in the trunk of a car may need to be refreshed sooner. In the event that your case gets dirty, since it’s made of durable recycled plastic, it can be wiped down or disinfected with any of your favorite kid-safe cleaning products. While there is no specific warranty period for the Me4Kidz Medibag Family First Aid Kit, the company states on their website, “Me4kidz prides itself on customer satisfaction [and] wants you to be happy with your purchase. If you have any questions or concerns about anything, please contact us [and] we will do the best to satisfy your needs.” You can contact Me4kidz by calling their customer service line at (480) 444-2332 or submitting an online form. From the durable and secure carrying case to the kid-friendly designs, the Me4kidz Medibag Family First Aid Kit is the best pre-made first aid kit available to purchase. The cost is reasonable. Inexpensive refills make for a great customer experience. And stickers are always fun.